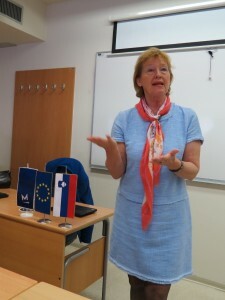 Today, 31st March, MEP Zofija Mazej Kukovič spoke to the students from the Faculty of Management at the University of Primorska. She presented her work in the European Parliament, as well as her initiative ?Kickstart Europe? and the ?Food for Health and Jobs? competition, which encourages entrepreneurship in the areas of agriculture, food and health. She began by saying: ?Because of the economic crisis we must look for opportunities where we previously did not deem them possible. There will be fewer and fewer traditional jobs available in the future. If instead of looking for a job, you seek work, you will certainly find it. You young people are full of wonderful and exciting ideas.? She then added: ?Food is needed all around the world. In Slovenia we import almost 2 billion euros worth of food each year, but we do not notice that tourists always seek local and indigenous products. This is not just about producing food, but knowing how to sell it. We must learn how to connect production, sale, innovativeness, internet, new technologies, indigenous crops, etc? This is why I formed the ?Kickstart Europe? team. Its goal is to convince young people of the business opportunities that can be found in food production and health, as well as bringing European practices and policies in this field closer to the citizens of Slovenia.? MEP Zofija Mazej Kukovič also pointed out important programmes such as Eurostars and COSME: ?Eurostars is a programme designed to support start-ups. A third of the EU?s budget is geared towards supporting young people and entrepreneurship. The EU is a vast market, which enables you to sell a lot of different products. However, you must be aware that owning a company demands a lot of hard work. You do not become rich overnight.? MEP Zofija Mazej Kukovič did not only encourage those present to start their own businesses, but also pointed out that it is very important for them to get as much experience as possible, to broaden their horizons and be aware of European trends: ?Young people today, such as yourself, speak several foreign languages. This is why you should pay attention to programmes such as Erasmus+, which offers you the opportunity to study or train anywhere in Europe. These are important experiences that you cannot get at home. This way we can also spot opportunities in Slovenia that we did not see before. ?